I prefer to use a non-stick pan—high sides are good—oatmeal likes to bubble up. Dump in some water—I use the water from the kettle after I’ve made my morning green tea. Add powdered cinnamon and ginger. 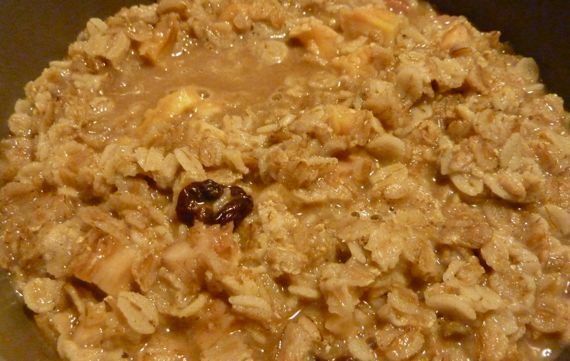 Dump in the rolled grain and some salt, stir and let simmer for about five minutes, then add dried fruit, and simmer a bit more. Divide into bowls, add some milk if you like. And chow down. I use about 1 cup of a rolled four-grain combo that Trader Joes sells (barley, rye, oats, wheat), and add a tablespoon or so of straight oatmeal (regular rolled oats). I use about a half-teaspoon of ginger, and more than that of cinnamon. My favorite fruit additives are dried bing cherries (no fat or sugar added) and dried white peaches—both also from TJs. I usually add about a quarter cup of milk to the water when I simmer the oatmeal. You can substitute all milk, even, and the oatmeal will be quite sweet. You can use the amount of liquid given on the rolled grain container as a starting place; you will need extra for the fruit to dehydrate. I get three servings from this quantity. Leftovers need to be broken up in the bowl (high sides, please), then microwaved (add some milk/water). The texture is slightly different, but the flavor is about the same.